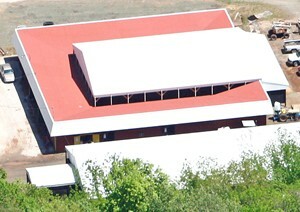 The Fort Classroom Complex includes four classrooms, a computer lab, and the Bucking Machine classroom all wrapped around the Fort Arena. While the majority of class time at Meredith Manor is hands on and takes place in the arenas, barns and farrier / massage shop, a portion of many of the career area classes take place in the Fort classrooms including Horse Health, Equine Massage Therapy, Equine Business Management and Teaching. Horse Health is a class that focuses on the general care of horses and introduces students to the practical skills necessary to administer basic first aid and to identify common illnesses associated with the horse. Students also learn to set up preventative health programs for the control of disease and parasites, and identify common lamenesses along with those conformation faults that predispose lameness problems. Equine Business Management, taught by Dr. Meredith, acquaints students with the concepts and methods of successful management of a horse business. Discussions of vehicle uses, facility design, cash flow planning, financing, record keeping, advertising and public relations are included. In Teaching I students will develop skills related to good communication, planning for instruction, and providing for effective teaching and learning. Students in this class are given opportunities to observe and analyze practicing teachers. They will also learn to organize and plan lessons for the various riding disciplines and/or content areas they will be teaching. Teaching I students work directly with the public, assisting with clinics and demonstrations at the school's facilities. As students get further involved in teaching classes, they will become more specialized to their riding discipline and be given more opportunity to apply the skills they have learned to independent projects or internships. Students in the upper level teaching classes may become involved with private lessons for students or lessons given to the public. In addition to the career area classes, riding theory classes take place at the Fort. 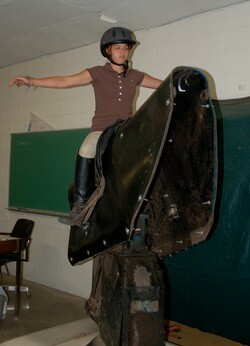 All students enrolled in a riding class participate in a theory class of their riding discipline each quarter. Theory classes provide for an understanding of the underlying principles of Dressage, Jumping and Western through a variety of techniques and opportunities for discussion. One technique that is used in theory is videotaping. Each student is videotaped riding twice a quarter. You and your theory instructor will then evaluate this video during class, which will allow you to benefit from a visual of what is happening in the saddle. One of the our most fun and useful teaching aids, the bucking machine, is also kept in the Fort and is used by riders of all disciplines. This device allows riders to work on their seat, while taking out the fear factor because the machine is steady, predictable and can be stopped at any time. Our next stop will be the Fort Arena, located in the center of the Fort Classroom Complex. I graduated in 2000 and have had incredible success in the professional world due to the skills I've learned through MM. MM showed me the way to become part of a program and learn how to see an overall picture not just its parts.